Autophagy is the degradation of a cell's own components within lysosomes (or the analogous yeast vacuole), and its malfunction contributes to a variety of human diseases. Atg9 is the sole integral membrane protein required in formation of the initial sequestering compartment, the phagophore, and is proposed to play a key role in membrane transport; the phagophore presumably expands by vesicular addition to form a complete autophagosome. It is not clear through what mechanism Atg9 functions at the phagophore assembly site (PAS) (Munakata and Klionsky, 2010). He et al. (2008) reported that Atg9 molecules self-associate independently of other known autophagy proteins in both nutrient-rich and starvation conditions. Mutational analyses revealed that self-interaction is critical for anterograde transport of Atg9 to the PAS. The ability of Atg9 to self-interact is required for both selective and nonselective autophagy at the step of phagophore expansion at the PAS. Atg9 multimerization facilitates membrane flow to the PAS for phagophore formation. It includes 6 putative TMSs. Eukaryotic cells employ autophagy to degrade damaged or obsolete organelles and proteins (Umemiya et al., 2007). Central to this process is the formation of autophagosomes, double-membrane vesicles responsible for delivering cytoplasmic material to lysosomes. In the past decade many autophagy-related genes, Atg, have been identified that are required for autophagic functions. In all types of autophagy, a core molecular machinery has a critical role in forming sequestering vesicles, the autophagosome, which is the hallmark morphological feature of this dynamic process. Additional components allow autophagy to adapt to the changing needs of the cell (Xie and Klionsky, 2007). 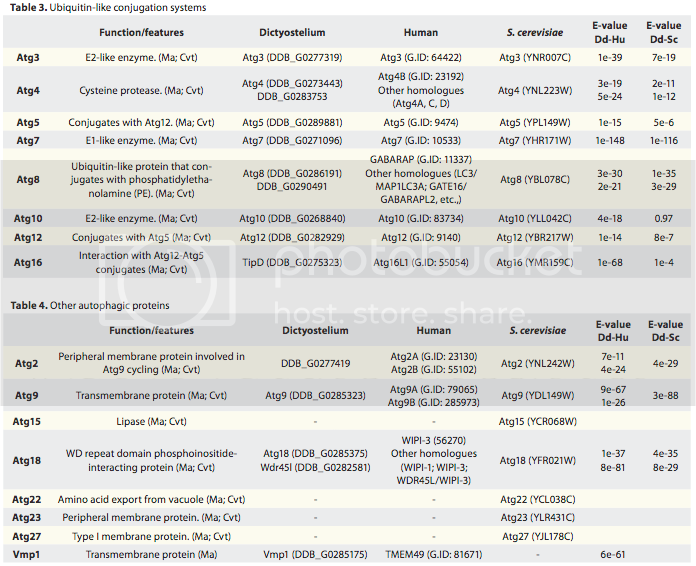 In yeast, approximately 31 autophagy-related (Atg) proteins have been identified. Most of them reside at the phagophore assembly site (PAS). Geng et al. (2008) reported the application of fluorescence microscopy to study the amount of Atg proteins at the PAS. They found that an increase in the amount of Atg11 at the PAS enhanced the recruitment of Atg8 and Atg9 to this site and facilitated the formation of more cytoplasm-to-vacuole targeting vesicles. In response to autophagy induction, the amount of most Atg proteins remained unchanged at the PAS, whereas an enhanced recruitment of Atg8 and 9 at this site was observed. During autophagy, the amount of Atg8 at the PAS showed a periodic change, indicating the formation of autophagosomes, and both Atg8 and Atg12 were ubiquitinylated (Geng and Klionsky, 2008). Novel Atg proteins and the stages of their action have been identified (Backues et al. 2015). Atg9 is the only characterized transmembrane protein that is absolutely required for Cvt vesicle formation, and it is proposed to carry membrane from peripheral donor sites to the phagophore assembly site where the vesicle forms. Additional proteins, including Atg11, Atg23, and Atg27, are involved in this anterograde movement, whereas Atg1-Atg13 and Atg2-Atg18 are required for the retrograde return to the peripheral sites (Munakata and Klionsky, 2010). Atg11 and Atg23 show low sequence similarity to MLP1 and MLP2 of the Nuclear Pore Complex (NPC; 1.A.75.1.1). These proteins include repeat sequences. Atg1 is a serine, thereonine protein kinase; also called autophagy protein 3 or cytoplasm to vacuole targeting protein 10. Intestinal Paneth cells limit bacterial invasion by secreting antimicrobial proteins, including lysozyme. However, invasive pathogens can disrupt the Golgi apparatus, interfering with secretion and compromising intestinal antimicrobial defense. Bel et al. 2017 showed that during bacterial infection, lysozyme is rerouted via secretory autophagy, an autophagy-based alternative secretion pathway. Secretory autophagy was triggered in Paneth cells by bacteria-induced endoplasmic reticulum (ER) stress, required extrinsic signals from innate lymphoid cells, and limited bacterial dissemination. Secretory autophagy was disrupted in Paneth cells of mice harboring a mutation in autophagy gene Atg16L1 that confers increased risk for Crohn's disease in humans. These findings identify a role for secretory autophagy in intestinal defense and suggest why Crohn's disease is associated with genetic mutations that affect both the ER stress response and autophagy (Bel et al. 2017). The table (Table 3) presented below is taken from (Munakata and Klionsky 2010).